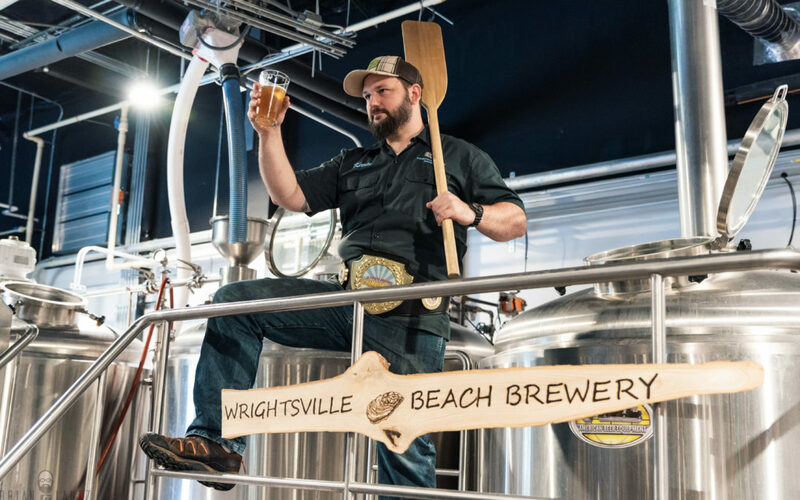 Kevin Zelnio is the head brewer at Wrightsville Beach Brewery. Zelnio began brewing while living in Sweden and eventually brought his talents back to Wilmington, NC. Last week I asked him what his journey into brewing was like. Born and raised where the Mississippi flows east to west in the Quad Cities, mostly on the Iowa side. What first got you into brewing? A good friend of mine started to dabble in home brewing and I joined in a couple times. But I didn’t really get into it until I moved to Sweden several years ago and lived out in the woods. I was working from home as a science writer and consultant and had a bit of time on my hands. Beer is also pretty expensive there and controlled by a state-run alcohol monopoly, so the nearest place I could get a beer was a 45-minute drive away. It became more of a practical thing for me, as well as a creative outlet! This is my sixth year as a commercial brewer. What was the first beer you made? With my aforementioned buddy we did a green tea pale ale with tettnang and cascade hops and green tea we bought from a market in Japan while at a deep-sea biology conference (my former life was a marine biologist). The first all grain brew I did on my own was a Sierra Nevada Pale Ale clone. What is your favorite beer to make? Stouts and porters. Nothing makes me happier than filling up the brewery with the smells of mashing in dark grains early in the morning! What made you want to start brewing on a larger scale? While in Sweden, I lived in a small village and our neighbors there enjoyed the free beer I was constantly giving to them. They encouraged me to start selling it. After raising the money, I selected a location in an old prison that was turned into a hotel in the small Baltic town of Västervik. Bryggeri Fängelset (literally meaning “The Prison Brewery”) was a small 3 barrel capacity brewery that I solely ran with my wife and business partners for almost 3 years. Having honed the creative skill set and brewing process, my wife and I decided we could have better opportunities back home in the US. After suffering the cold north for far longer than I needed to, I landed a great job as a production brewer at Jdub’s Brewery in Sarasota, Florida. 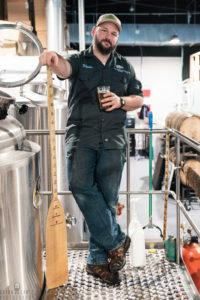 There, I got comfortable with large tanks and big machinery and learned the skills and techniques for high volume production brewing that I currently use now as the Director of Brewing Operations at Wrightsville Beach Brewery. Brewing on a 20 barrel capacity gives me the leeway and creativity I crave in a career while working with an amazing, supportive team. There is truly nothing better than making a product that people really enjoy. Is there anything you do differently in your brewing process that other places do not do? Every brewery has their niches and strengths. I love having the freedom to experiment with ingredients, like fruits and herbs, in the brewing process and playing around with barrels. It starts from the water — where I build up each batch’s water mineral profile from the ground up— to the final product where we measure parameters, dial in carbonation and monitor the quality of the fermentation and packaging processes at every step. What is one thing you want your consumer to take away from trying your beer? The most important thing to me is that I brew up a wide diversity of styles and offerings. I don’t expect everyone that walks in to love every single brew I make, but hopefully they find a few very enjoyable and want to come back to see what is new. I am proud of every beer we put out and we always strive for the best quality possible in our products. I think it shows and I hope our customers notice it too!